In general, the body type ranges from Foreign (aka Oriental) to Cobby (Persian/Exotic) with a range of shapes inbetween. 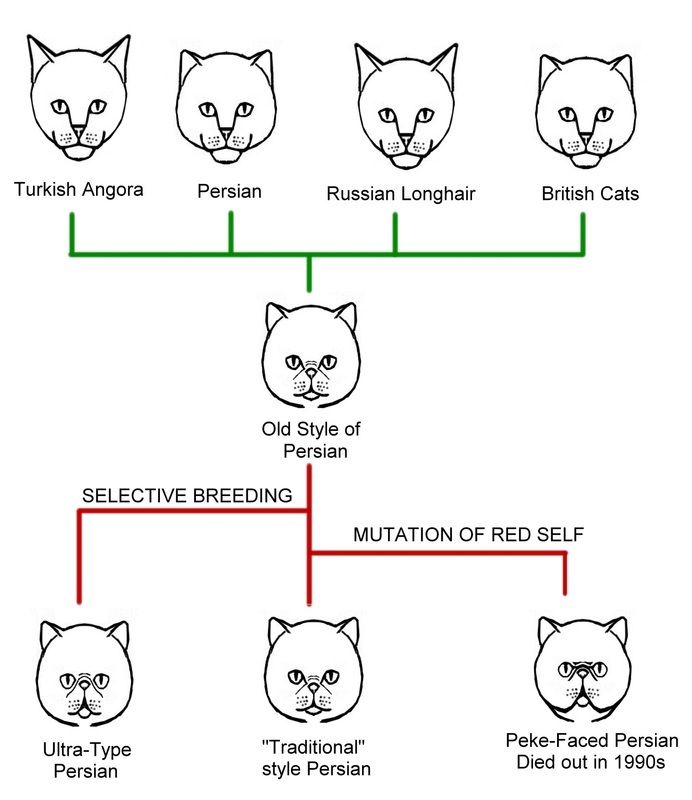 There are breed-specific variations on each theme e.g. modified foreign. The terms petite and substantial are sometimes used in relation to the intermediate body type. As well as the main body types, there are several other variations such as the tucking up of belly skin or shortening of the legs. 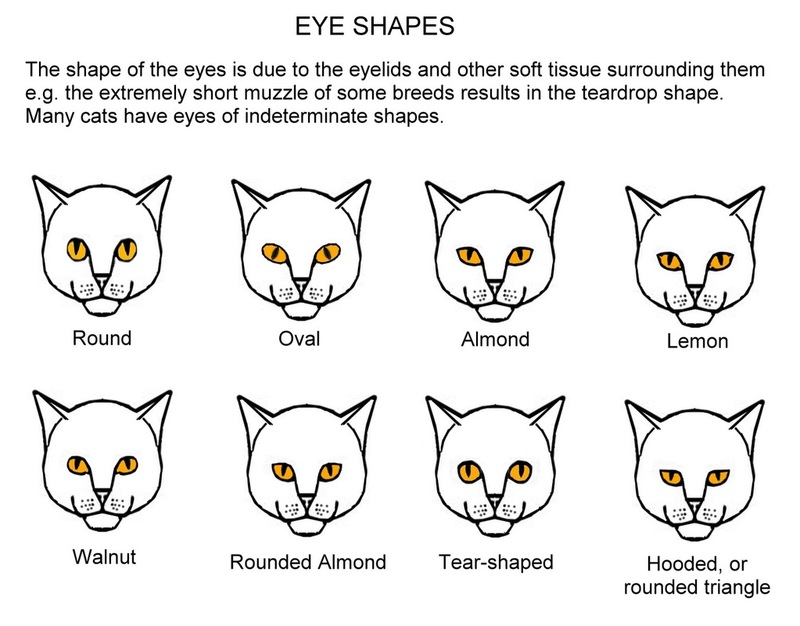 The shape of the eyes is due to the eyelids and other soft tissues. 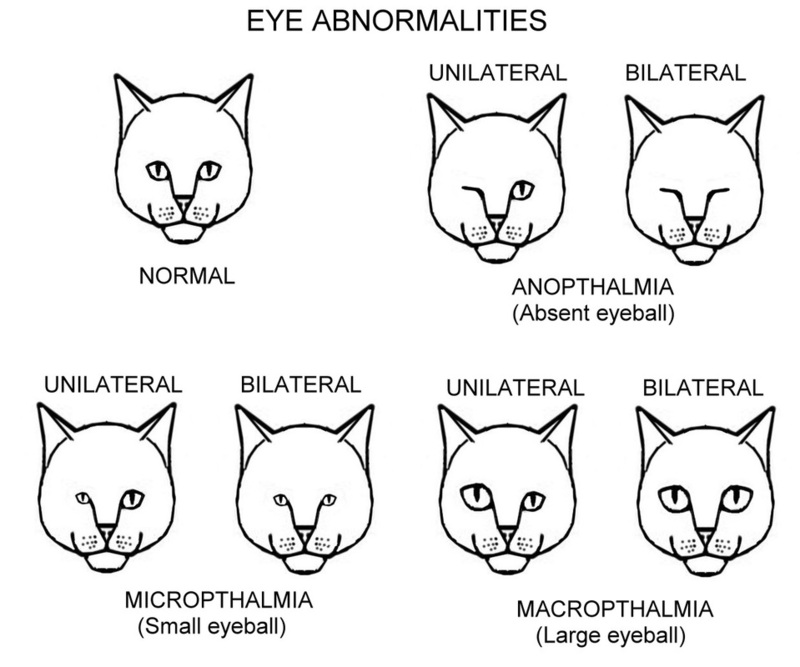 The eyeball itself is always round, but the shape of the visible eye surface varies. The ears can vary in placement on the head as well as in shape. There are also several ear anomalies such as duplicated ear flaps. The extra ear flaps are cosmetic only and not connected to the inner ear. 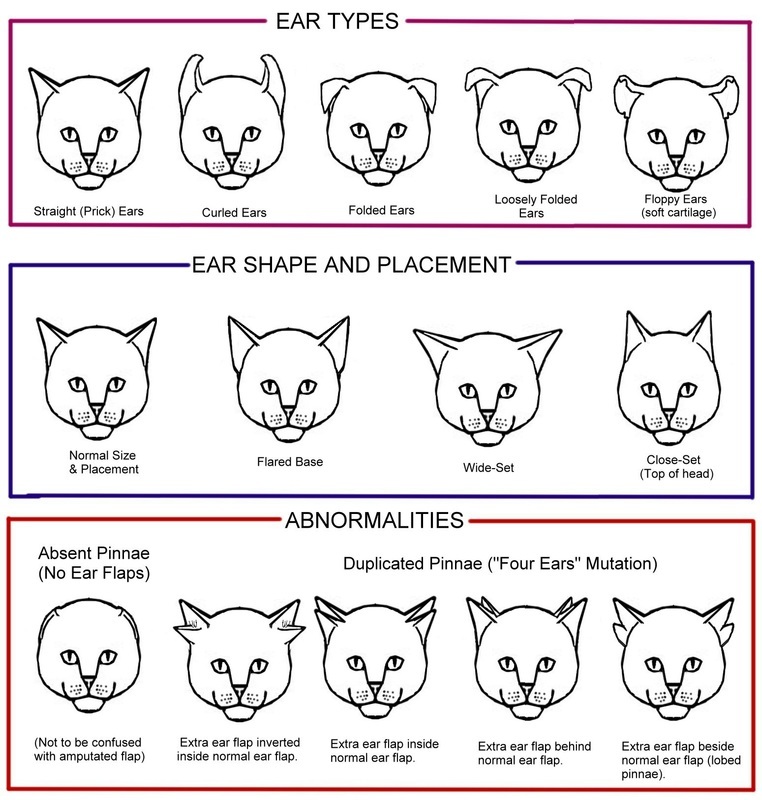 "Floppy ears" is due to soft cartilage and has been observed in some Siberian lines; unlike curled or folded ears, floppy ears are not set in a particular shape. There are several tail mutations and there is variation within each mutation e.g. 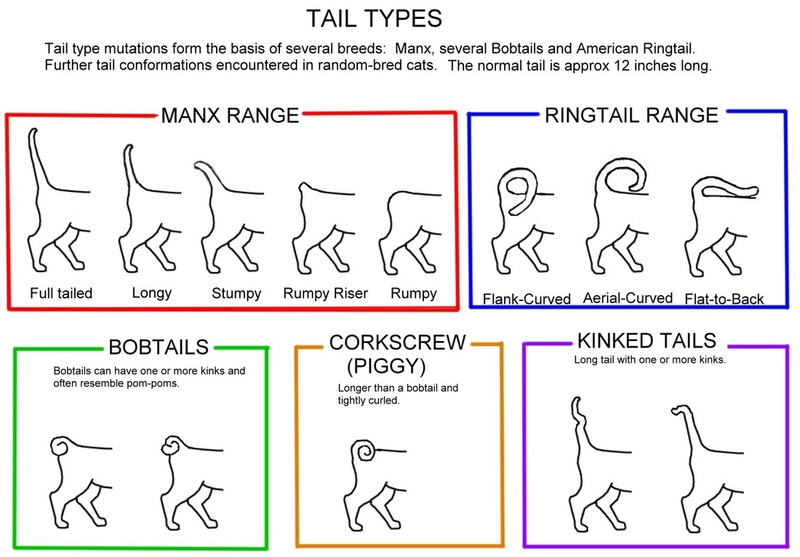 several lengths of tail are found in Manx cats. 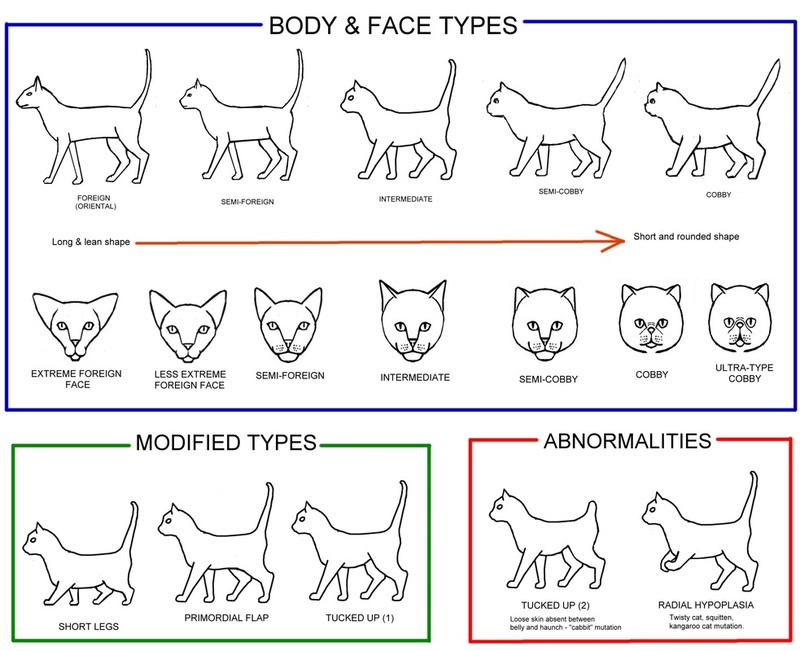 The chart shows the normal fore-paw and several mutations. 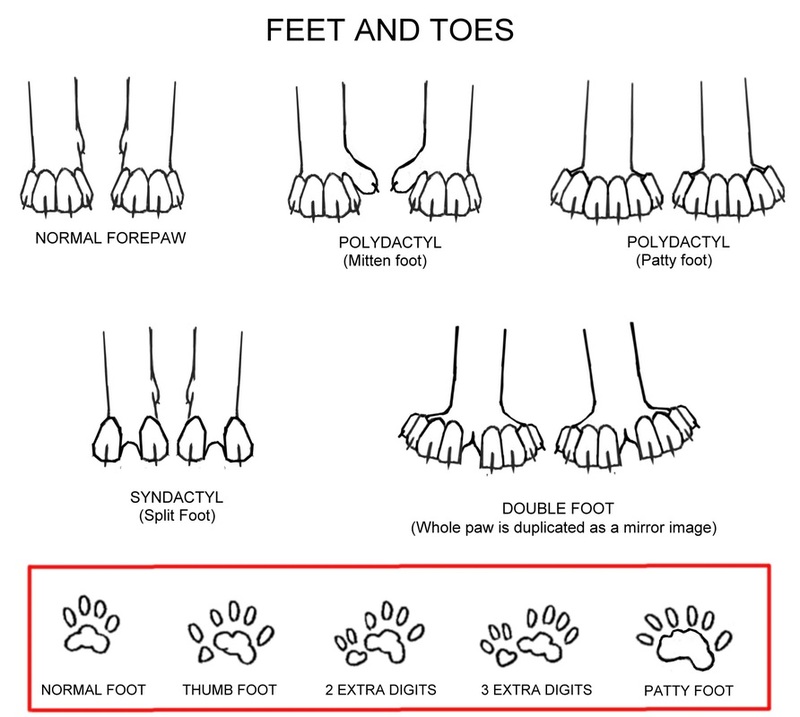 The "Patty Foot" form of polydactyly is associated with radial hypoplasia, but the "Mitten Foot" form is benign. The example show for Syndactyly has a central cleft and 2 toes, but the cleft can occur anywhere on a normal foot e.g. 3 toes on one side of the cleft and one toe on the other. 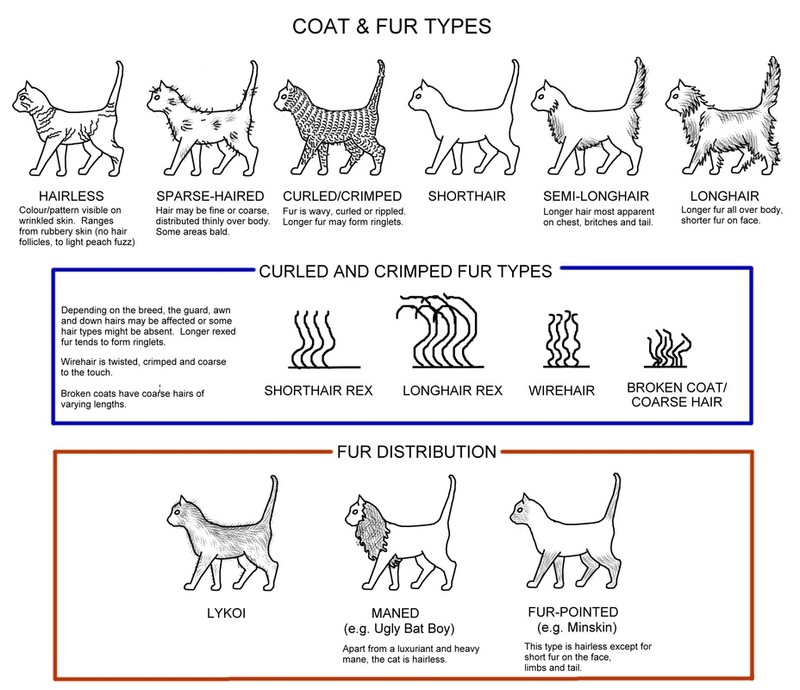 The chart is very generalised regarding rexed fur. Some rex-type cats have guard, awn and down hairs affected while others have only awn and down affected. Some lack one type of hair. Rex-types include the LaPerm. Wirehair types include the Bramble. An interesting effect can occur where the pigment granules in the fur cause the texture to change. For example, solid black colour fur feel sleeker to the touch. 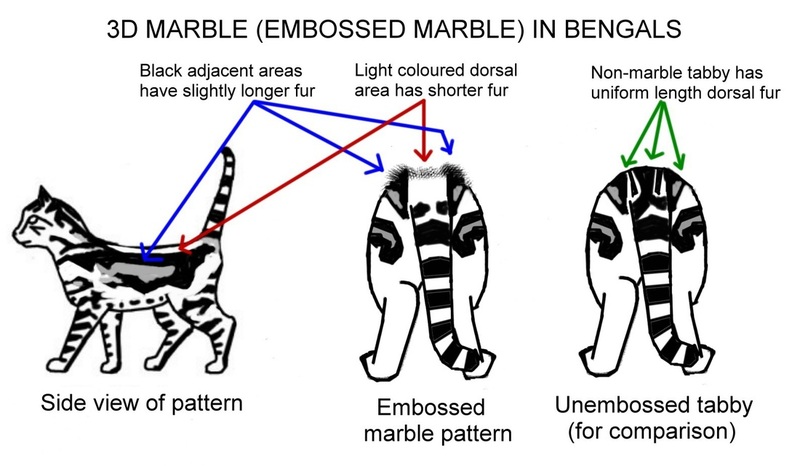 In the marbled Bengal, the dorsal area is agouti rather than a black stripe (as in other tabbies). The fur of this agouti stripe may be shorter than the adjacent black fur of the horizontally-aligned marble pattern. This is shown below. Credit to Sarah Hartwell for this article.